In these first weeks of school we ask children to come into new classrooms with new people and begin forming relationships that will last through middle school at Inspired Teaching Demonstration School and beyond. This can be just as scary and intimidating as it is exciting. "Find someone in this room who you don’t know, who may look different than you, who may speak a different language than you, and share the acrostic poem you wrote about your child, one positive thing that has happened since school started, and something that has been really hard for you or your preschooler." We were delighted with what we saw! 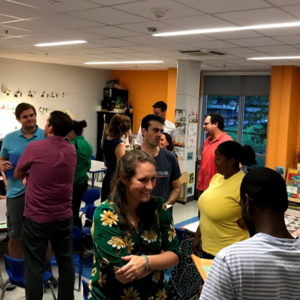 New and returning families jumped right into this challenge and immediately made connections based on shared experiences (and those of their children) so far this school year. I witnessed individuals go out of their way to walk to the other side of the classroom to connect with a new face. Families from both of the preschool classes shared in laughter and satisfaction while relating through similarities and differences. When it was time to return to their seats, several conversations could be heard ending with invitations to continue later. There was true community building happening! Since Back to School Night I have been thinking about all the ways we can truly embody community building and live it daily in our practice. Can we challenge ourselves as a community, whether we are teachers, faculty, families, or volunteers, to make connections, even if that means standing outside of our comfort zones? Does it mean making a point to meet someone new in the hallways every day? As a parent, could it look like volunteering in the classroom and learning about the cultures represented in your child’s room? How can each of us be intentional about seeking opportunities to get to know, individually, the members of our community? I look ahead to this school year with optimism, gratitude and excitement about the opportunities for connection and relationship building that will take place in our school.